Admin level users can manage Tag lists and tags from the Tags page in Settings. Tag lists are great ways to standardize reporting across your projects. Just set one up and add the tags you want people to attach to their entries. 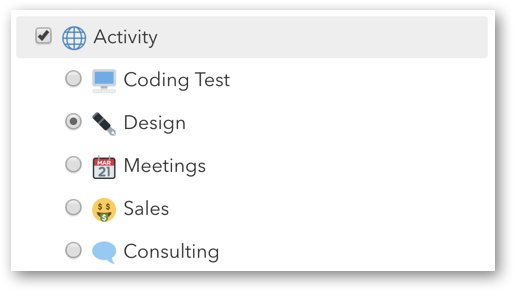 *Now you've named your grouping, create or select the tags you want to add to it. Tags are great for seeing how long different project phases take e.g. the tag "Bugs" under the tag list "Programming", or the tag "Sketching" under the tag list "Design." 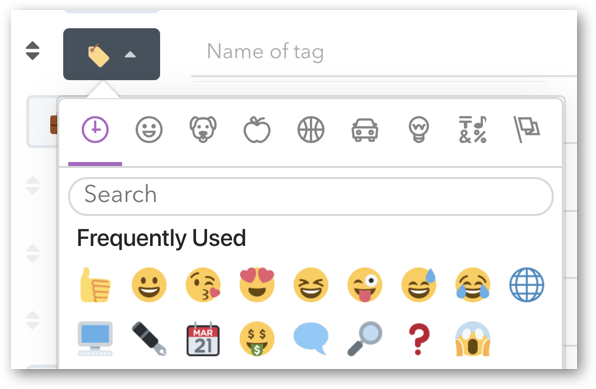 Tags can have an emoji. Add, edit, and delete as many tags as you want right from the Tags page. If you need to edit the title of a tag, no problem-o. Just click on the name of the tag list and you'll be presented with a free text box. Type your new name and hit enter. Tags can be rearranged within tag lists. Just select a tag using the radio-buttons and drag to rearrange. *While tags can be rearranged within tag lists, a tag cannot be moved to a separate one. 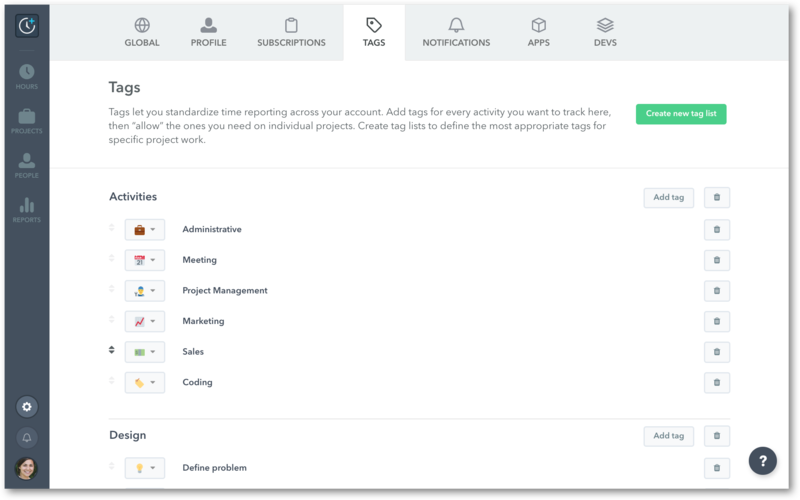 When you create a new tag from the tag management page, you'll first will need to add the tag to the project you'd like to log hours to. If project specific tags are not added to the project, you will not see a tags option on your entry. When writing a note for your entry, use the "tab" key to select an existing tag from the checkbox list. Don’t see the tag you want to use? Just click "Manage Tags" to add more (e.g. "Testing"). The next time you add a new entry, you’ll be able to use that tag on this project. An entry can have as many tags as you want (depending what tag lists you allow on each project). *Note: You can only select one tag per tag list. If you want to be able to use multiple tags, you should create multiple tag lists. Is it possible to move tags to another tag list? It's not quick, but it's possible. Create a new tag list and give it a title, then go to each entry with the old tag and switch it to the appropriate one from your new tag list. 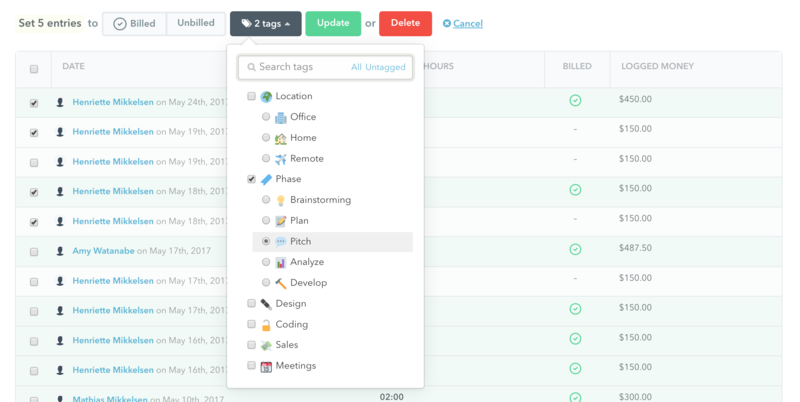 Who can create and manage tags? Where can I see all the time I've logged for each tag? All hours logged on a tag can be viewed in the Reports section. Learn more on how you can generate a report on your tags. Can I bulk update several hours with a tag in one go? Absolutely. Bulk updating your hours is great for when you need to apply a particular tag to many hours for several different users all at once. You can do this swiftly inside the project whose hours you want to apply the tag to. Use the checkboxes on the left-hand side, just like when you mark hours as billed. Then select which tags you want to apply to the hours selected and hit "Update". 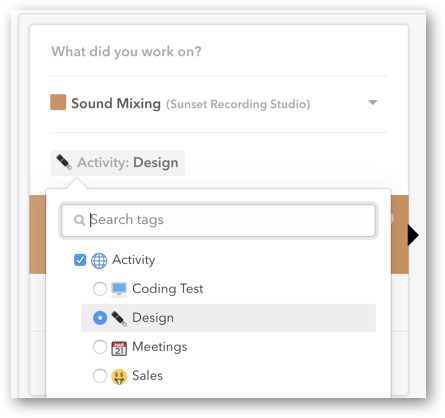 Any existing tags will be replaced with the updated options; make sure you include all tags you want to include on the entries. *You can also bulk delete hours if you need to. We recommend that you use this feature carefully, since once you delete hours you cannot get them back! Read more about what tags are.